Australian, evergreen tree or shrub with a columnar to pyramidal shape, endemic to Lord Howe Island, Norfolk Island, and parts of Queensland. Oval, olive to grey green leaves, 5-10 cm long. Flowering in summer and early autumn with hibiscus-like, 4-8 cm wide flowers, pale pink, fading to white. Stamens are arranged in a single, central column, typical for members of the Malvaceae (mallow family). Flowers are followed by furry seed capsules, filled with tiny hairs which are like fiber-glass splinters and cause itching and skin inflammation. Lagunaria patersonii 'Royal Purple' has crimson flowers. Prefers a sunny position in well-draining soil. Does not like wet feet. Not suitable for heavy clay soils. Can handle considerable drought and copes well in poor soils. Ideal for coastal gardens and windy locations. Tolerates light frosts. Versatile plant for flower display during late summer. Suitable for screening and hedging purposes. Tends to have branches and foliage all the way along the stem from ground level, but can be grown as a clear-stemmed specimen by regularly removing new growth from the main trunk. The canopy is relatively narrow, so even though Lagunaria patersonii can grow quite tall, it is suitable for smaller spaces. 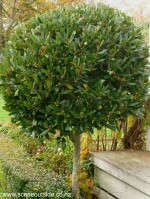 Plant this tree in areas where the seed pods cannot pose problems (i.e. away from pools and public spaces, in particular those frequented by children). Evergreen shrub in the mint family (Lamiaceae), native to southern Africa. Flowering in late summer and autumn with bright orange, tubular flowers arranged in whorls along upright, four-angled stems. Becomes woody at the base and herbaceous elsewhere, so is more accurately specified as a sub-shrub. Opposite, densely hairy, linear leaves to 10 cm long by 2 cm wide. Is reported to have hallucinogenic and medicinal properties. Naturalised in various parts of the world, including Western Australia and New South Wales in Australia, Hawaii and California. Prefers a position in full sun, but tolerates semi-shade. Can be grown in any soil type as long as it is well-draining. Drought-tolerant once established. Cut back to near ground level in winter to maintain a tidy habit. Tolerates moderate frosts (zones 9-11). Suitable for coastal gardens. Striking plant when flowering with brilliant orange flowers. Good for the back of borders or sunny hot banks. Clump-forming herbaceous perennial, native to moist habitats in eastern USA and parts of Canada. Long flower spikes with rosy purple, fluffy flower heads. 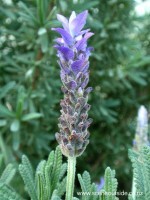 From early summer, flowers open gradually from the top of the spike downwards. Grass-like leaves, mid green, 10-30 cm long, becoming progressively shorter along the flowering stems. Several cultivars are available, including white flowering, and dwarf forms. Attracts butterflies, bees, moths and hummingbirds. Liatris spicata has numerous synonyms, including Kuhnia spicata, Lacinaria spicata, Suprago spicata, and Serratula spicata. Prefers a sunny position in any moist, but well-drained soil. Also grows well in partial shade, and, except in sandy soils, is able to cope with some drought. Cut back to near ground level after flowering. Can be propagated by dividing the tuberous roots in early spring. Frost hardy. Looks best when planted in groups in the middle of borders, in particular when combined with plants that have different flower shapes, such as daisies, Echinacea, and dahlias. Suitable for coastal gardens. Long-lasting cut flower, and can be dried too. Fast growing, New Zealand native ground cover. Small (1 cm wide) flowers from spring to autumn, followed by purplish red berries. Tiny, nearly circular, evergreen leaves with toothed margins. Lobelia angulata used to be known as Pratia angulata. It is an endemic New Zealand species, occurring naturally in quite damp areas of the North island and the South Island, as well as Stewart Island. Grows well in a sunny or partially shaded position. Tolerates wind and dry to moderately wet conditions. Frost-hardy (zones 7-9). In full sun, Lobelia angulata forms a tight mat, whereas in the shade the plant can become quite stretched. If it is planted in a good spot, it grows very fast. In my design-work, I usually recommend this ground cover in more or less confined spaces where it cannot easily invade lawns or other areas. Dainty herbaceous perennial, native to South Africa, flowering from spring to autumn with small blue to violet, pale-centered flowers in loose panicles, fine stems and tiny leaves. Flowers are 1-2 cm across, and have five-lobed corollas with three larger and two smaller lobes. Lower leaves are oval in shape, 1-3 cm long, often flushed with a reddish-purple tinge, and have toothed margins. Leaves on flowering stems are linear, and usually have an entire margin. Many cultivars are available, with a trailing or upright habit, and flower colours ranging from shades of purple and blue, to pink, cerise, and white. Pictured here is Lobelia erinus 'Lucia Dark Blue', a trailing variety with gorgeous sky-blue flowers. 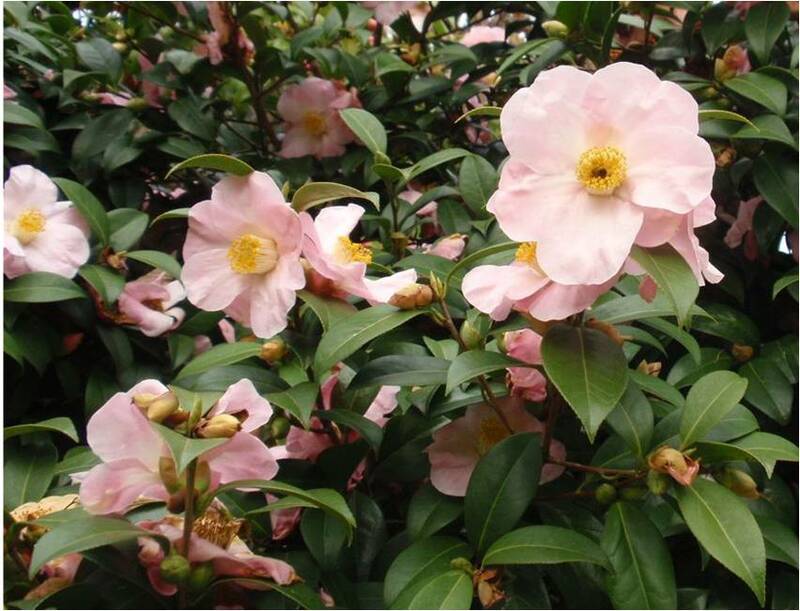 Prefers a sunny position (partially shaded in areas with hot summers) in well-draining soil. Looks best when the weather is cool, but usually stops flowering during summer when temperatures become too high. If that happens to your plants, you can cut them back to encourage another flush of flowers later in the season. Lobelia erinus 'Lucia Dark Blue' is more heat tolerant than many other varieties. For best performance, apply compost and fertiliser once a year. Fertilise container plants once a month. Suitable for coastal areas. Tolerates light frosts, and in colder climates Lobelia erinus is generally grown as an annual. Trailing varieties are particularly attractive when allowed to spill over the edges of containers, window boxes and hanging baskets. Upright varieties make great edging plants and colourful additions to rock gardens. 'Kathryn' is one of several cultivars of Lophomyrtus x ralphii, a hybrid of the New Zealand native species Lophomyrtus bullata (ramarama) and Lophomyrtus obcordata (rohutu). 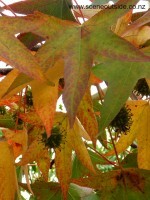 Leaves are oval, 1-2 cm long, puckered, deep purplish red with green. Creamy white flowers during summer, 1 cm across, followed by reddish purple berries. Prefers a sunny or partially shaded position in well-drained soil. Tolerates moderate frosts. Responds well to clipping. Attractive contrasting plant. Widely used for hedging purposes. Foliage suitable for floral art.